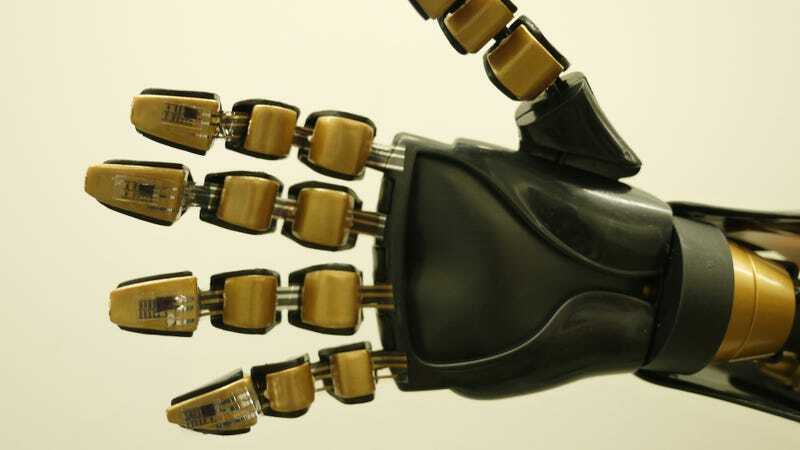 Cutting-edge prosthesis are amazing, but they lack one very important feature: a sense of touch. Now a research team from Stanford University has developed artificial skin that can sense force exerted by objects—and then transmit those sensory signals to brain cells. Inadequate sensory feedback is a serious limitation of current prosthetic limbs, whether they be artificial hands, arms, or legs. Users need to be able to sense how an object is responding to their touch in order to have optimal motor control. Otherwise, it’s difficult to know how much force is being exerted on an object, or sense things like temperature and texture. What’s more, the sense of touch—or even the illusion of it—can alleviate phantom limb pain, which affects some 80% of amputees. We’re still a long ways off from being able to create artificial skin that feels and reacts the same way that natural skin does, but the Stanford team, led by electrical engineer Benjamin Tee, recently performed a proof-of-concept experiment that takes us a considerable step closer. By using flexible organic circuits and an innovative new pressure sensor, Tee’s team developed a kind of artificial skin that can sense the force of static objects. What’s more, this sensory data was then transmitted to cultured, i.e. in vitro, brain cells of mice using optogenetic technology. They have published the results of their work in the journal Science. The system, called DiTact (Digital Tactile System), is based on a low-power, flexible organic transistor circuit that transforms the feeling of pressure into the same kind of signals generated naturally by natural skin’s mechanoreceptors. These signals were in turn converted to a series of voltage pulses. To get the sensors to record the wide dynamic range of pressure, the researchers used carbon nanotubes molded into pyramidal structures. These microstructures allowed to researchers to maximize the sensitivity of the sensors in a way that closely approximates the sensitivity of natural skin’s cutaneous receptors. On their own, these signals do nothing. In order for them to be experienced as sensory feedback, they have to be transmitted to a brain. To that end, the researchers took these signals, which ranged between 0 to 200 hertz, and transmitted them via optical fibres to the cortical neurons of mice. DiTact is still in an early phase of development, so the researchers transmitted the signals to cultured cells in vitro, rather into the brains of live mice. This technique, referred to as optogenetics, could eventually be used on live subjects. Through this process, neurons are stimulated to fire or stop firing by genetically-engineering neurons that respond to light. A transgene from algae makes neurons fire when they’re exposed to blue light, and a bacterial transgene causes them to respond to yellow light. But for this experiment, the researchers had to use an alternative optogenetic solution to account for the rapid rate at which sensory information is processed by neurons. Chortos points to the work of Andre Berndt and Karl Deisseroth who developed a new type of optogenetic treatment that allows brain cells to be stimulated very rapidly so that they’re compatible with the speed of real mechanoreceptors. Tee’s research team shows that the new optogenetic proteins were able to accommodate longer intervals of stimulation, which is a strong indication that the system might be compatible with other fast-spiking neurons—including peripheral nerves. In other words, DiTact will likely work in live mice, and possibly humans. And indeed, the researchers told Gizmodo that the next step in their research will be to use their sensor to stimulate the nerve of live mice. Given that the signals were transmitted to clumps of cells in a petri dish and not a live animal, how could they be sure their signals were of the right nature and intensity? Indeed, the ultimate goal is to imbue human prosthetics with touch-sensitive artificial skin. Nguyen says that early work involving sensory feedback with neuroprosthetics in humans has been promising, but there is a need for larger and more involved human studies to understand how to effectively and safely stimulate nerves to provide sensory feedback. Indeed, this avenue of research will become safer and less ethically dubious over time. In order for optogenetics to work properly and safely in humans, for example, researchers will have to figure out a way to get optogenetics to work without resorting to invasive fibre optic wires and the viral delivery of transgenes to patients. According to Polina Anikeeva, a professor of Materials Science and Engineering at MIT, it may soon become possible to use stem cells from the patient and enable their sensitivity to a particular wavelength of light through genetic manipulation outside the body. She told Gizmodo that these cells can then be potentially reintroduced into the peripheral nerve of the patient allowing the latter to be optically stimulated. No wires, no ethically dubious trans-genes. Anikeeva says it may also be possible to use neural stimulation to enhance the ability of the nerve to regenerate themselves or even form intimate interfaces with synthetic sensors. Suffice to say, we won’t see these sorts of technologies for years, if not decades. But thanks to the work of Tee and his team at Stanford, the path to reaching this goal is getting increasingly clearer. Read the entire study at Science: “A skin-inspired organic digital mechanoreceptor”.